DeepBurner is a CD/DVD burning software that utilizes power and effeciency. 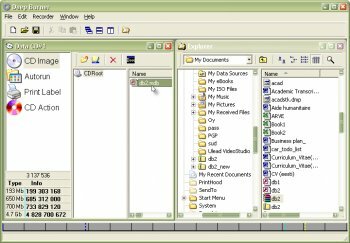 You can create data, bootable, and audio CDs as well as data DVDs. Friendly and intuitive user interface with drag-and-drop features helps in all aspects: starting from compilation of data and audio to be burn onto a CD/DVD till making and printing labels for the particular type of media storage. DeepBurner Free Portable works straight from your removable media, whether it's a USB flash drive, compact flash card, or even a good old floppy. This works perfectly! I was looking for a simple drag-and-drop-move-resize label maker, and I got a perfectly usuable burner too. excellent software to have for a thumb drive! works flawlessly and it's easy to use!